LOS ANGELES (CNS) — The release of thousands of pages of personnel files by the Archdiocese of Los Angeles detailing allegations of clergy sexual abuse has focused new attention on the roles of church leaders and their handling of the cases over four decades. A review of some of the documents indicate that diocesan officials addressed the allegations regularly as the number of reported cases began to climb in the 1950s, peaked in the 1970s and began to fall off in the 1980s and 1990s. The documents, released Jan. 31 under court order, suggest that Cardinal Roger M. Mahony and Auxiliary Bishop Thomas J. Curry, who was the archdiocese’s vicar of clergy and chief adviser on sexual abuse cases, worked to protect priests from criminal investigation beginning in the 1980s. The files also show that Bishop Curry suggested to Cardinal Mahony that they prevent the priests from seeing therapists who might alert authorities and that the priests be given out-of-state assignments to avoid criminal investigators. The release of the documents comes nearly six years after the archdiocese reached a $600 million settlement covering more than 500 people who made claims about being sexually abused by priests and other church personnel. Some of the priests who had claims against them sued to keep their names from being released, saying it violated their privacy rights. That led the diocese to undertake a years-long legal battle to keep the files private. But a Superior Court judge ruled in January that the names of personnel identified in the files could be made public, clearing the way for release of an estimated 12,000 pages of documents involving 128 clergy. Meanwhile, Los Angeles Police Department detectives have started reviewing the records to determine whether there are any cases that can be prosecuted, the Los Angeles Times reported. California law limits prosecution in such cases to incidents that have occurred since 1988. Many of the documents predate that year. 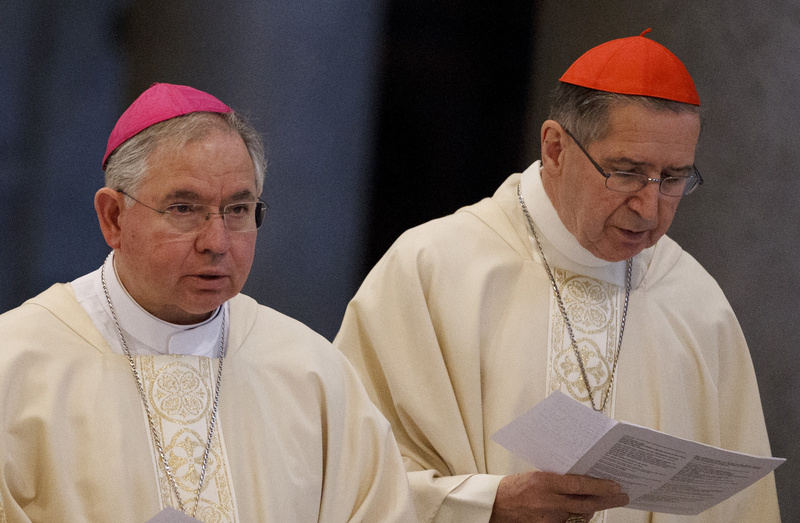 The revelations in the documents led Archbishop Jose H. Gomez, who succeeded Cardinal Mahony in March 2011, to tell the cardinal that he would “no longer have any administrative or public duties” within the archdiocese. Archbishop Gomez also said he agreed to a request by Bishop Curry to be relieved of his duties as the regional bishop of Santa Barbara. Cardinal Mahony responded with a letter to the archbishop that he posted Feb. 1 on his personal blog, Cardinal Roger Mahony Blogs L.A. The posting outlined his response to clergy abuse allegations beginning in 1985, the start of his tenure as archbishop of Los Angeles. “Nothing in my own background or education equipped me to deal with this grave problem,” he wrote. He also said that Archbishop Gomez began to become aware of the archdiocese’s steps to protect children and youth when he arrived in Los Angeles May 26, 2010. “Not once over these past years did you ever raise any questions about our policies, practices or procedures in dealing with the problems of clergy sexual misconduct involving minors,” Cardinal Mahony wrote. Editor’s Note: The personnel files documenting the Archdiocese of Los Angeles’ response to clergy sexual abuse can be found online at http://clergyfiles.la-archdiocese.org/listing.html. Cardinal Mahony’s blog is online at http://cardinalrogermahonyblogsla.blogspot.com/.